If you get snow blindness, you’re worthless. Snow goggles, which protect the eyes from sun damage, were made in many different styles. This pair from Barrow has individual wooden eyepieces, connected by strands of red and blue glass beads. The long, narrow eye slits blocked excess light but still gave a wide field of vision. Anna Etageak: My poppa used to get snow blind. He said, “Araaah!” Really hurt. So he used to wear this kind [snow goggles]. Frances Charles: [Used in the] springtime. So they won’t get snow blind. Art Ivanoff: The glare [to protect eyes against the sunlight reflected from snow and ice]. Oscar Koutchak: I got snow blind once, and I had to stay in the house for three days. If you get snow blindness, you’re worthless. It’s painful. Achapak used to use those too. Theresa Nanouk: I think most all the seal hunters did a long time ago. Stephen Loring: Did your father make his own pairs? Theresa Nanouk: He was always making them. Anna Etageak: Out of wood. But they were never neat like this. He made them himself any old way. Oscar Koutchak: It’s good work. Wooden snow goggles. Frances Charles: Yukłuktaak. Yukłuktaaŋik ipkua pisuugait. 1. 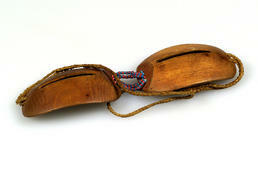 The Iñupiaq Elders from Barrow did not discuss this pair of snow goggles. The discussion presented here comes from a discussion by Iñupiaq Elders from the Unalakleet area of a similar pair of snow goggles E024340. 2. According to Frances Charles, snow goggles were used when out in the snow and on the ice. 3. The name for this in the North Slope dialect of Iñupiaq is yuġluqtaak [sun goggles].